Sports has been an important part of human's life. Sports help in physical fitness as well as mental well-being. Among them, Tennis is one of the most popular sports in the world. Naomi Osaka is a big name in Tennis and she is currently ranked 4th in the WTA rankings. Naomi Osaka's career in Tennis has reached its peak but what about her personal life? Is she currently in a relationship? Rumor has it that she is currently dating someone. That someone is said to be a tennis player from Japan. Is Naomi Osaka Dating a Boyfriend? Naomi has kept her personal life quite a secret. She hasn't yet officially revealed about her relationship or boyfriend. She seems to be totally focused on her career. Even after looking over her social media posts, there isn't a single clue or hint about whom she's dating or in a relationship with. However, there's a news about her having dinner with someone. So, who's that person she's having dinner with? At the Rome Open, Naomi revealed that she had dinner with a fellow Japanese tennis player, Kei Nishikori. "I want to feel like I'm friends with Kei. I'm not really sure if he thinks I'm his friend. But, I mean, he's really -- like, he's a really, really nice guy. It really surprises me how nice he is. I had dinner with Kei and Miyu Kato. And basically, it was them trying to talk to me." "And I'm just giving like the one-word replies. But, to be fair, okay, in Madrid, the dinner starts really late. And I'm an early sleeper, so I was like sleepy halfway through the dinner. And so I was like (demonstrating), and they were trying to talk I went with my physio, and she was like poking me.And she was like, Wake up! And, yeah, I think that's how Kei -- Kei probably has like a really weird impression of me." It seemed as if they were quite interested in each other and who knows what may happen in future? Naomi's fans are quite eager to know about her relationship in the coming days. During an appearance on Ellen DeGeneres show, she opened about her celebrity crush on Micheal B. Jordan. Surprisingly, she got the most amazing birthday gift from the famous actor via Twitter post. Naomi Osaka came in limelight after she defeated top seed, Serena Williams. In the US Open 2018, Naomi Osaka's first match was against J. Glushko. She won easily in that game. In the next match, in the round of 32, she had an easy victory over Belarusian tennis player, A. Sasnovich. In the round of 16, she showed her magic in the match against A. Sabalenka held at Louis Armstrong Stadium. It was quite a tough competition between them but ultimately, Naomi again won this match. She reached the Quarter-final match held at Arthur Ashe Stadium against Ukrainian tennis player, L. Tsurenko. She had an easy win in that game. The semi-final match was between Naomi Osaka and American player, Madison Keys. Naomi defeated her 6-2, 6-4 and reached the finals of women singles in the US Open 2018. She faced the six-time U.S. Open champion, Serena Williams in the finals. Williams lost 6-2, 6-4 to Naomi and walked away with two penalties and a hefty fine for three counts of alleged misconduct. The game was quite controversial and Williams accused the umpire of sexism. This was the first ever Grand Slam final match for Naomi Osaka. In that game, umpire, Carlos Ramos judged a gesture from William's coach, Patrick Mouratoglou to be coaching her and gave Williams a first code violation. She refused that she hadn't received any coachings. She was again penalized for racquet-smashing. The 36-year-old Williams got furious and started shouting at the umpire. 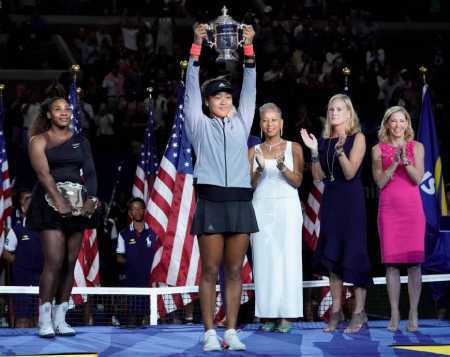 When Osaka received the trophy, she apologized for disappointing the crowd. She was quite sorry for ending the match like that and almost broke into tears. Currently, Naomi is confirmed for the Hong Kong Tennis Open and currently preparing for it. She came at no. 4 position in the world in October 2018 and she is projected to become world no. 1 on 28 January 2019. 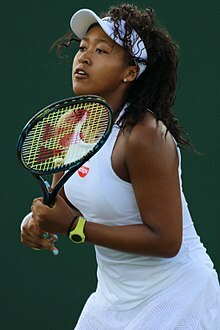 Naomi Osaka was born on October 16, 1997 in Osaka, Japan. Her father's name is Leonard Francois and her mother is Tamaki Osaka. Her father is from Haiti and his mother is from Japan. Her elder sister is Mari who is also a tennis player. Currently, she ranks 4th in the WTA rankings. Her net worth is estimated to be around $8 million.